Sporting two tiers of Rookie Cards, four terrific multi-swatch jersey inserts and a windfall of great autograph offerings, Trilogy Hockey delivers hits throughout the set. 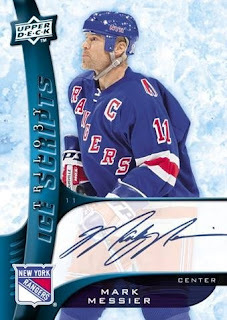 With its trademark scheme of 1 signature, rookie or jersey card in every pack,... Trilogy delivers from the minute go. Add in some of the low-numbered multi-player plexi-glass autographs, and it’s a winner. Get 3 autograph, rookie and jersey cards in every box. Find 1 great hit in every pack. Also find multi-player card of this sleek, popular insert. Added this year: Autographed Jersey cards. Three distinct inserts numbered to just 5. Look for Classic Confrontations dual-sided jersey cards. These great hits fall 2 per case. Grab at least 2 swatches on every jersey card in the set. Get more low-numbered jersey parallels. Case Break:2 Classic ConfrontationsTwo-sided, 3 players per side2-3 Hat Trick Heroes Jerseys Three swatches per card. Jerseys:Gretzky/Robitaille, Ovechkin/Backstrom, Lafleur/Shutt, Lecavalier/St. Louis, Datsyuk/Holmstrom and more. Classic Confrontations:Sakic/Bourque/Roy – Elias/Niedermayer/Brodeur Datsyuk/Zetterberg/Hossa – Crosby/Malkin/Staal and more!